There are many ways to configure this modern and versatile system for all your comfort needs. 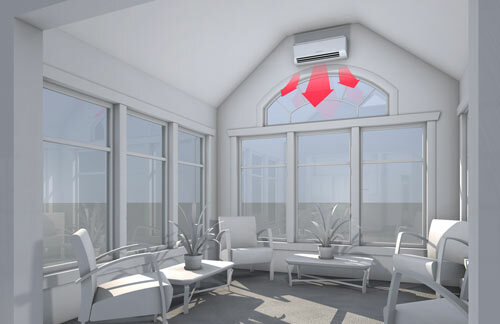 Highly efficient and effective, a ductless system is the ideal primary heating and cooling solution for your home or business in New England. Mistsubishi Ductless Systems are up to 40% more efficient than traditional systems. Ductless splits, also called “Mini-Splits” pump cooled or heated refrigerant directly to the wall or ceiling-mounted air-handling unit, and each unit has its own wireless electronic temperature control system, a.k.a., a remote. The indoor unit uses refrigerant to cool or heat air and quietly pushes the chilled air it where you need it in your living space. Refrigerant and electrical lines connect the outdoor unit to the indoor unit through a 3″ opening in the exterior wall. 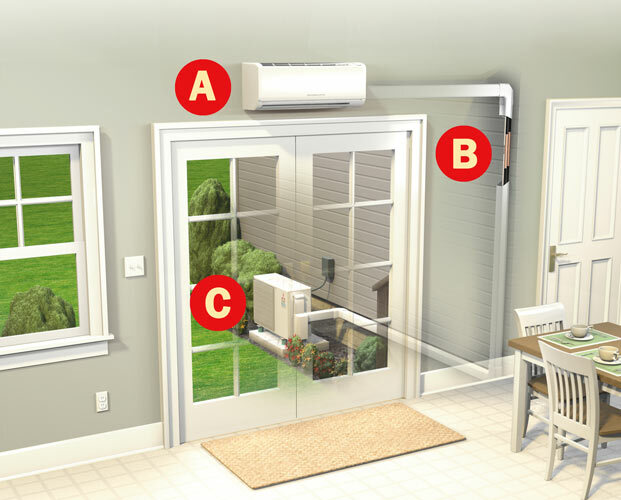 The outdoor unit’s state-of-the-art heat pump cools orwarms refrigerant and sends it back inside to the air handler, which continuously monitors the room for changes in temperature and sends conditioned air to the areas of the room that need it. You can heat and cool a single zone or multiple zones. Perfect for additions, basements, sunrooms or any other space that offers a comfort challenge. 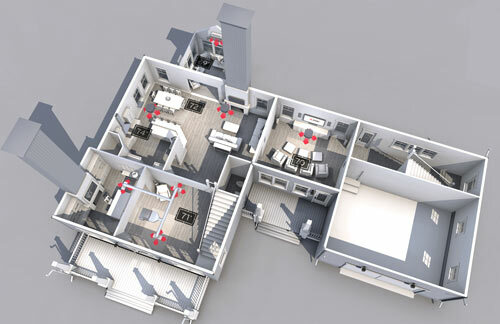 Keep all the rooms of a house at maximum, individualized comfort levels without all the ductwork. Ductless is a perfect solution for homes with problem rooms that just never feel comfortable. You know, a great room with a high ceiling, or large glass exposure. A sun room or addition. Even a converted attic, or a remodeled room over a garage. Ductless systems allow you to pinpoint the area of your home you want to condition, which always takes some of the load off your existing HVAC system, saving you money. Check out the video to find out more about how Mitsubishi ductless is such a great solution for single zone applications or click the button below to download a brochure. With a ductless system it’s easy to choose exactly how much you want to heat or cool each room or zone of your home to accommodate your family’s preferences and lifestyle. Does dad like it cool and mom like it warmer? Kids off to school and spending most of your time in two or three rooms? With a ductless solution from N.E.T.R. Inc., you can eliminate energy use in the rooms you’re not using, or design a climate in your home based on the factors that make you and your home unique.